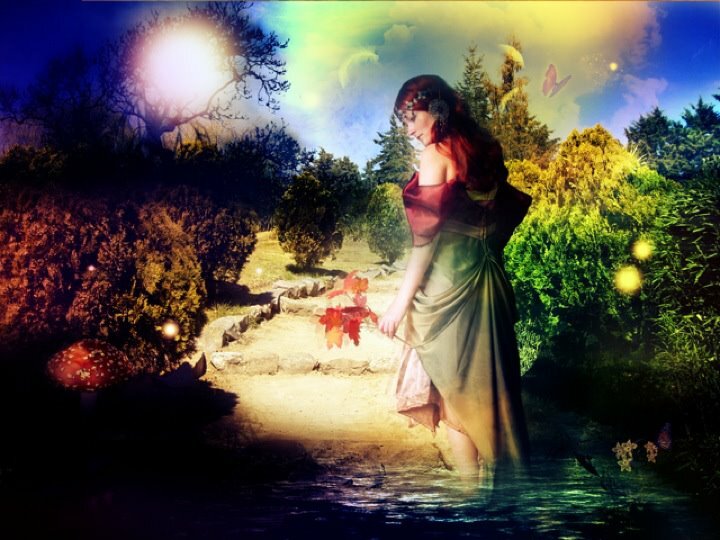 “Ahes’ themes are water, abundance, fertility, passion and courage. Her symbols are seawater and sea creatures. This ancient pagan Goddess symbolizes the sea’s abundance, fertility and passion. She also teaches us about courage; She fought fervently against Christian influences to turn Her into a monstrous figure akin to a siren. Ahes was honored with a plethora of beautiful ceremonies around the end of summer. If you have a beech tree nearby, you can follow the custom of gathering beneath it’s bowers or nearby a small pond. Here, wash any white cloth (perhaps an altar cloth). This brings Ahes’s health and productivity to wherever you keep that fabric swatch. For those who can’t find a beech tree or a pond, just add a little salt to your laundry today instead for a similar effect. I have found in my research that Ahes was also referred to as Dahud-Ahes and Dahut. According to Patricia Monaghan, “this pagan princess lived in Brittany, the far-western Celtic wilderness of France, during the period when the Christian monks were destroying the remnants of the old European religion – the worship of maternal nature. These flesh-despising monks ruined the princess’ pleasurs until Dahut begged her father, King Gradlon, to build her a retreat from the cruelties of the new way. Gradlon seemed to ignore her, but all the while he was secretly building a magnificent city for her. Located on the rocky Pointe du Raz and called Ys, it was to be hers to do with as she wished. When he presented it to Dahut, the sensual princess was filled with joy at the splendid homes arranged to catch the setting sun’s rays. Dahut’s people were rich and happy, but it soon became clear that Ys had been built too close to the sea. Storms endangered the small fishing craft by which the people of Ys earned their wealth. Dahut asked Gradlon to build them a safe harbor, but the king, threatened with damnation by the monks, built instead a fin new church to the Christian god right in the center of Ys. Furious, Dahut rowed that night through dangerous coastal waters to a secret island where women – possibly immortals – continued to celebrate the ancient rites. There she asked them to command the sea spirits, the Korrigans, to help her; she offered eternal fidelity to the old ways in return. But then Dahut’s ambition poisoned her. Granted the aid Ys needed, Dahut asked for yet another miracle: that magical powers would raise her palace high above the Christian church. She was granted that, too, but her selfish desire took its toll. For many years Dahut and her people lived in splendor and pleasure. But the princess’ sickness grew. Eventually she began to take one-night lovers, having them destroyed immediately after they left her. The powers of passion and ambition that Dahut had stirred grew so strong that finally the king of the waters himself came to claim the princess – and he drowned the entire city of Ys when he did. 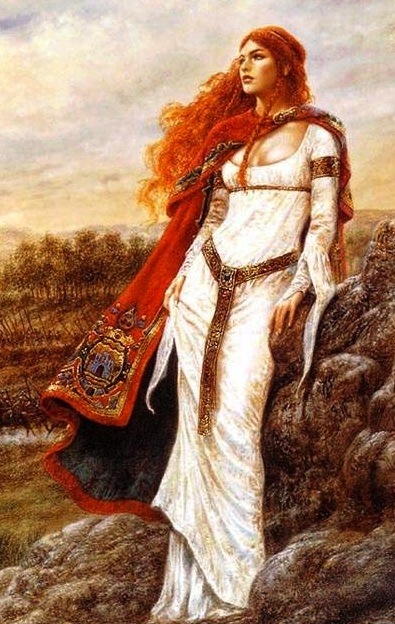 Although the above story is told as a local historical legend, it is possible that Dahut was originally a Breton Goddess – possibly Celtic, for her image recalls that of the Welsh Arianhod, who similarly mated with the ocean king. But Brittany was also a center for pre-Celtic civilizations of note, including that of the megalith builders whose alignments to the winter solstice surround the hamlet of Carnac. Dahut’s heritage could thus, like that of Celtic Brigid, include ancient material transformed as times changed” (p. 95 – 96). At Joellessacredgrove.com, it states that “modern legends tell that her city was swept away by a wave caused by an intervening Christian saint. Pagan stories tell how she asked a city of Korrigans, the Breton sea faeries, to disguise her sea world until it was safe again for them to emerge again in a world without religious persecution. In this way she is similar to the sleeping deities, such s King Arthur, who lie in a state of suspended animation waiting until their people call upon them again. Dahud was dubbed a Goddess of ‘debauchery’ by her detractors, while some more recent legends go so far as to make her the destroyer of her realm through her excesses and her worship of ‘idols’. Patriarchal legends say her father, recognizing her as evil, either escaped her world, or drowned her. Arthurianadventure.com, “Morgan le Fay” (down to section labeled “Brittany”). Joellessacredgrove.com, “Celtic Gods and Goddesses D,E,F“. Monaghan, Patricia. The New Book of Goddesses and Heroines, “Dahut”. Covenofthegoddess.com, “Goddess Dahut Vision Ritual“. O’Keeffe, Christine. Tartanplace.com, “Dahut, Dagosoitis (Guardian of the Waters) Dahud Ahes, Ahès (Good Witch) Marie-Morgane (Born of the Sea) Sirona, Syrene, Seraine (Star)“.